Yes, I know Halloween has passed, but since the title of this blog is Ruminations and Reflections, I feel obligated to ruminate and reflect. There are some things about Halloween I dislike: the gore, the mayhem, the implied violence, and the ugly costumes. Waitresses dressed like witches make may appetite disappear. Store clerks dressed like Dracula or zombies are a bit too close to home. I prefer that bank tellers not wear bunny costumes, not even once a year, and never in public. Adults, at least, should maintain some semblance of dignity, even on Halloween. On the other hand, I thoroughly enjoy doling out candy to the princesses, ballerinas, space aliens, angels, devils, zombies and other creatures who knock on my door Halloween night. They are so cute. In our neighborhood, trick or treating is popular. Most, even the older children, are accompanied by parents who stand at the curb, reminding the children to say ” thank you.” The children and the parents seem happy to be out together. It’s good to be reminded that the American family is still alive and healthy. My husband and I did sacrifice some of our dignity by wearing masks when we answered the door. My husband brought several masks home. Two were quite beautiful, but didn’t quite fit, proof again that one size does not fit all. 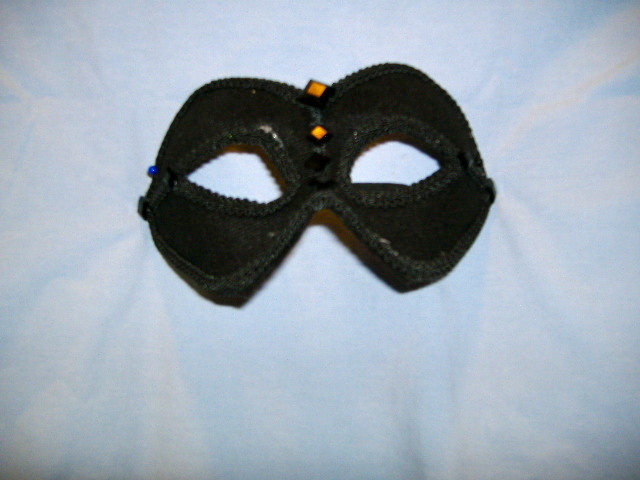 The third one, a sort of cat-like mask, fit, and I wore it. My husband donned the Lone Ranger mast I bought him. (Who was that masked man?). Yes, there are pictures, but not with us modeling them. This is the first beautiful mask my husband gave me. It has a place on my bulletin board. 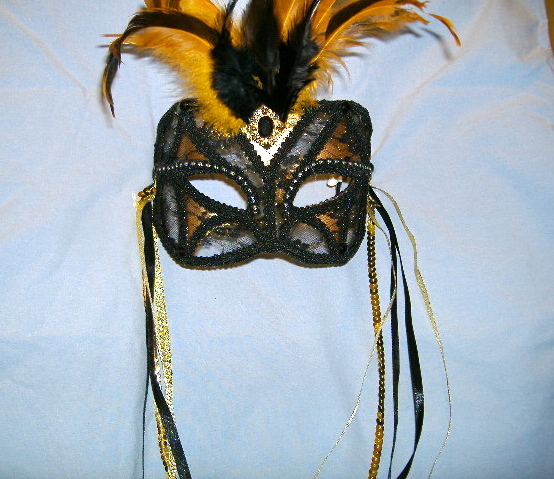 This is the second beautiful mask. Alas, it did not fit. This is the third mask and the one I wore. It was just right. (Shades of Goldie Locks). 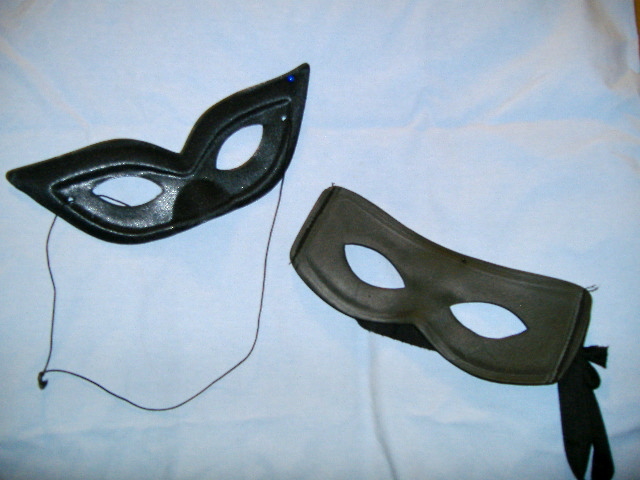 My husband’s Lone Ranger mask is also featured. We did have fun, but like many people, we have one lingering problem. What do we do with all the leftover candy? Unfortunately, we have a lot of it. Guessing how much candy to buy for Halloween without risk of running out before all of the trick or treaters have knocked on your door is an art, not a science. This year, despite a fairly good turnout, we vastly overestimated. I have thought about this issue and have come up with four possible, but flawed, solutions. Here they are. 1) Declare it “Take Your Candy To Work Day” and leave the extra candy in the break room. The flaw? Overwhelmed by this tactic, some office have discouraged this practice. Since I do not work in an office, this is not an option for me. 2)The Zucchini Drop. Often employed by home gardeners in California, excess (and there is a lot of it) zucchini is anonymously left on a neighbor’s doorstep. Some ring the doorbell and run, but I don’t recommend it. There’s too much danger of being caught. If you are caught, you end up graciously accepting some of your neighbor’s tomato crop, even though you also have a tomato surplus. Somehow the Candy Drop to homes with children seems unfair to the children and the parents who pay the dental bills. 3) Eat it Yourself. A very bad strategy. We buy the kind of candy we like, so both this option and the calories are particularly dangerous. 4) Throw It Out. What? And waste all that money? Fortunately, there is a better option. This morning, November 2, 2013, an article by Claudia Buck appeared in the Sacramento Bee. The article was entitled Kids Sell Back Candy To Send to Soldiers. This article describes a program where dentists collect kids’ Halloween candy and pay them a certain amount, usually a dollar a pound. The dentist then sends the candy to Operation Gratitude, which uses the candy as fillers in the thousands of care packages sent to U.S. soldiers. You can find a local participating dentist by going to the website http://www.halloweencandybuyback.com and entering your zip code. According to Claudia Buck’s article, some dentists continue the collection into early next week. You can, of course, send candy directly to Operation Gratitude. Their website is http://www.operationgratitude. This is a good option for dealing with excess candy. The best option for the U.S. soldiers is to bring them home, safely and soon. I will have to try the Dentist plan next year for the candy ….. all the other strategies didn’t work very well this last year…. Your dentist will be proud.